Kodiak Alaska is an amazing and awe inspiring location! The overwhelming beauty of our location often causes our guests to claim it is the most amazing place they have ever seen! Wildlife sightings are expected and common. ​Whales, Otters, Sea Lions and Puffins were viewed on all trips of the 2018 season! When compared to other ocean fishing ports in Alaska, we enjoy the shortest boat rides for the most fish! We seldom get 'weather' days. There is nearly always a direction to travel to find calm waters filled with opportunity! Vast reef systems are what make fishing in Kodiak unique and so very productive. No other port in Alaska offers this combination of rich shallow waters and relative proximity to excellent fishing. 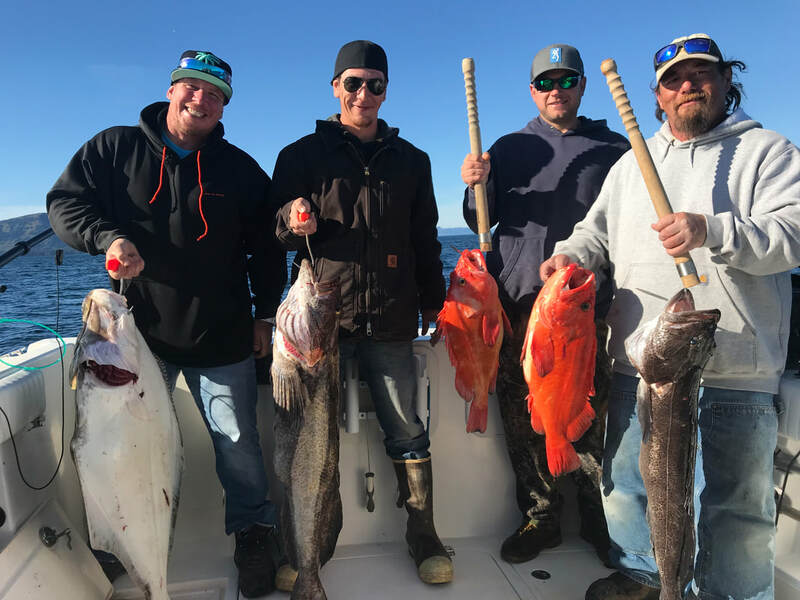 Kings, Silvers, Lingcod, Halibut, and Rockfish are often all caught on the same reef with multiple species hooked up at the same time. No traveling 4 hrs to the 'halibut' spot to fish for a 1 hour tide change... Boat rides can be fun, but we enjoy FISHING more than boat rides! Its definitely worth the extra airplane ride to come to Kodiak! Multi-species trips are the normal, and retention limits are seldom not met. Contact us today to Start Planning your Adventure!